KUALA LUMPUR (Dec 8): The FBM KLCI sank 8.53 points or 0.49% to 1,740.84 on selling pressure as cautious investor sentiment prevailed amid lower crude oil prices and a weakening ringgit. Danny Wong, CEO of Areca Capital Sdn Bhd told theedgemarkets.com that the continuing selldown in Bursa Malaysia was due to “negative sentiment” among stock traders on Bursa Malaysia as they reacted to the persistent fall in global crude oil price. “I do not think that this trend of falling oil price will continue for too long but precisely how long this will persist is a very good question,” said Wong. The KLCI had reduced losses after reaching a low of 1,735.92 points on gains in stocks like Tenaga Nasional Bhd and RHB Capital Bhd. Across Bursa Malaysia, 1.24 billion shares with the total value of RM1.52 billion were traded. 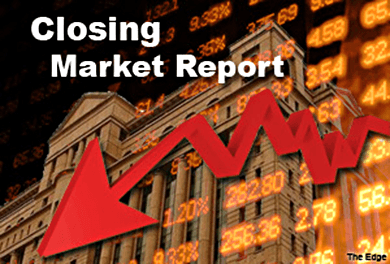 Bursa Malaysia saw 540 decliners outnumbered 258 gainers, while 293 counters remained unchanged. Top gainers included Petronas Gas Bhd followed by Petronas Dagangan Bhd and Quality Concrete Holdings Bhd. Top decliners included Hong Leong Capital Bhd, British American Tobacco (Malaysia) Bhd and Aeon Credit Service (M) Bhd. Bursa Malaysia’s most actively traded stock was Bumi Armada Bhd which saw 35.3 million shares done. At the end of trading day, the counter closed at RM1.09, up 5 sen or 4.81%. The ringgit fell to 3.4950 versus a strengthening US dollar at 4.50pm, its weakest in five years. Crude oil traded lower. Reuters reported that Brent crude oil fell more than a dollar to around US$68 a barrel on Monday, just above five-and-a-half year lows, after Morgan Stanley cut its forecasts, saying oversupply would peak next year after Organization of the Petroleum Exporting Countries decided not to cut output. Reuters reported that Asian shares were mostly lower on Monday after sobering data highlighted the sluggishness of the region's key economies and tempered the lift from much stronger-than-expected U.S. employment numbers.